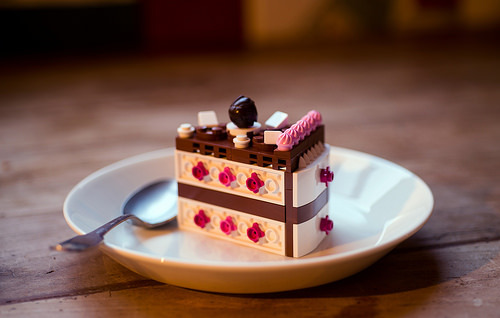 Sometimes LEGO looks good enough to eat, and this is certainly the case with Sad Brick‘s Cranberry Black Forest cake. This plastic take on the classic German desert appears to have the key ingredients of chocolate sponge, cream, kirsch, more cream and a black cherry on top. A puzzle for you: do you know which part has been used to depict the cherry? The best part is that this cake is definitely fat-free.